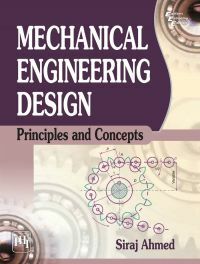 This textbook is designed to serve as a text for undergraduate students of mechanical engineering. It covers fundamental principles, design methodologies and applications of machine elements. It helps students to learn to analyse and design basic machine elements in mechanical systems. Beginning with the basic concepts, the book discusses wide range of topics in design of mechanical elements. The emphasis is on the underlying concepts of design procedures. The inclusion of machine tool design makes the book very useful for the students of production engineering. Students will learn to design different types of elements used in the machine design process such as fasteners, shafts, couplings, etc. and will be able to design these elements for each application. Undergraduate students of Mechanical Engineering. SIRAJ AHMED, PhD, is Professor and Head, Department of Mechanical Engineering, Maulana Azad National Institute of Technology, Bhopal. Dr. Ahmed has more than two decades of experience in teaching, research and industrial consultancy. He is also the author of a book Wind Energy: Theory and Practice (published by PHI Learning). His research interests include mechanical engineering design and wind energy.